aged 26 years & 4 days. Whose Remains lie here entombed. by her Husband erected & inscribed. Fame spread her worth a Husband knew it well. 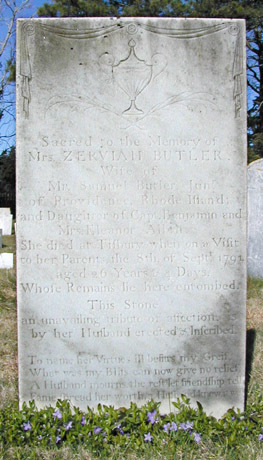 Mrs. Zerviah (Allen) Butler was the daughter of Tisbury cooper Benjamin Allen and his wife Eleanor Athearn. See The Butler Family of Martha's Vineyard for more information.